Excessive drooling in dogs and cats – When should you be worried? Drooling is quite common in dogs and most of us think nothing of it but is drooling in cats common too? The answer to the question is, “No”. Cats do not drool without any reason. So, if you notice your cat drooling, there is something wrong with it. In fact, excessive drooling is abnormal in both dogs and cats and it’s a sign that your furry friend needs to be seen by a vet to get to the root of the problem. In this article, we’ll find out when excessive drooling in cats and dogs is abnormal and what you can do about it. Helps prevent tooth decay and mouth infection. All animals produce saliva but when they start producing saliva in excess, along with other symptoms described below, a vet should always be consulted to rule out any illness. To an extent, drooling is normal in dogs. Every dog drool when he/she is anticipating his/her favourite treat, food or toy. In other words, it’s a reflex. Some dog breeds drool a lot, while the others drool just a little. For example: Breeds like Mastiffs, Bloodhounds, Saint Bernards and Newfoundlands are known for drooling more than the other breeds. When is dog drooling not normal? Although every dog drool, it may become excessive when your dog experiences some problem. 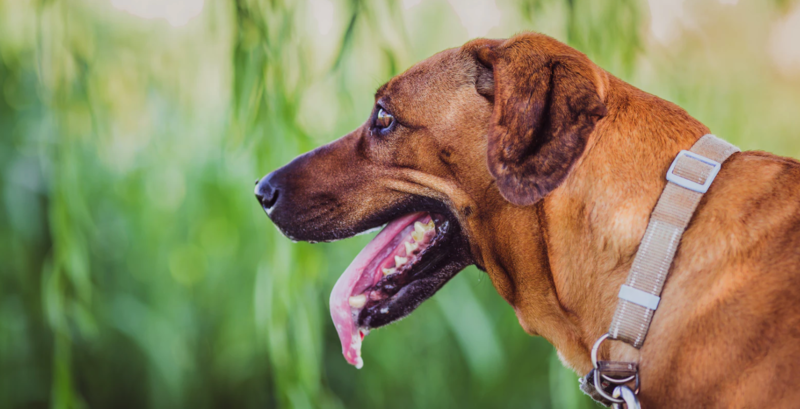 Drooling due to heatstroke: All dogs salivate to cool down but in summertime if you notice your dog panting heavily, drooling and extremely tired then it could be a sign of heatstroke. Drooling due to anxiety: If drooling is accompanied by panting, trembling or other signs of nervousness, then your dog is probably anxious. Drooling due to pain in mouth or throat: If you notice your dog drooling excessively even in the absence of a stressful situation, it could be a sign of pain in teeth or throat. Drooling occurs in such cases because your dog is unable to swallow the saliva in his mouth due to pain. Oral pain may be caused due to many reasons, such as – tooth infections, gum diseases; foreign object trapped in its mouth or even due to a tumor in his mouth or throat. Drooling due to nausea: When dogs feel nauseated, they don’t want to swallow the saliva, so they just let it fall out of their mouth instead. Dogs that are carsick salivate excessively when travelling in a car. Gastro-intestinal issues, kidney and liver diseases can also cause a dog to be nauseous and drool excessively. Drooling due to poisoning: Dogs can drool excessively if they ingest something toxic, like a poisonous plant, chemical or toxic food. This type of drooling is often accompanied with other symptoms, such as – vomiting, diarrhea, shaking, seizures, bleeding and lack of energy. If you notice your dog drooling excessively, contact a vet and give a thorough history of your dog’s health, including current medications, vaccination status, possible toxin exposure, or any other possible incidents that might have led to that condition. This will help the vet to make the right diagnosis and treat your pooch accordingly. While drooling in cats is very rare, some cats do drool as they purr, but that’s very rare. So, if you see a cat, who has never drooled before drooling then it might be a symptom of an underlying problem. When swallowing hurts, cats don’t want to swallow the saliva, so they just let it leak out of their mouth instead. Painful swallowing in cats can be due to many reasons, such as – broken tooth, gum disease, infected tooth, foreign object trapped inside cat’s mouth or tumors and ulcers (caused by kidney failure) inside the mouth. If you see your cat drooling and notice other symptoms, like – thick saliva, discolored or blood tinged saliva and bad breadth; contact a vet ASAP. Viral upper respiratory infections (URI) also cause excessive drooling in cats. In URI, excessive drooling is accompanied by other symptoms, such as – sneezing, nasal discharge, ocular discharge, fever, depression and loss of appetite. A systematic approach is important in making the right diagnosis. Just like dog owners, cat owners should also givea thorough history of their cat’s health to help the vet make correct diagnosis. Frequent vet visits combined with at-home care will keep your “purry” friend happy and healthy for life. If our pets could talk, it would have been so much easier for us to understand them and their problems better. But a perfect world doesn’t exist, and we can only rely on the external signs and symptoms to understand their problems. So, the next time you see your Fido or Kitty drooling without any reason, don’t ignore it; it might be your pet’s way of telling you that he/she needs your help. Harsh Arora is a proud father of four rescued dogs and a leopard gecko. Besides being a full-time dog father, he is a freelance content writer/blogger and an educationist, with more than 6 years’ experience in the field of content writing.